St. Anna Chapel was built in the 1200’s as a coastal chapel for the numerous herring fishermen from Bornholm and Germany who fished around the island. According to legend, St. Anna Chapel was built by a count who had been rescued from sea. It was originally intended that it be built at Norresand, but what built there during the day disappeared during the night. The chapel was not completed until its present site was chosen. During the Middle Ages, the original Romanesque chapel with narrow chancel and wider nave was transformed into a Gothic nave. The building measured 17.5 x 6.5 meter and originally had a height of roughly 3.7 meters. It was built as a double walled structure of rough granite with cloven corners. 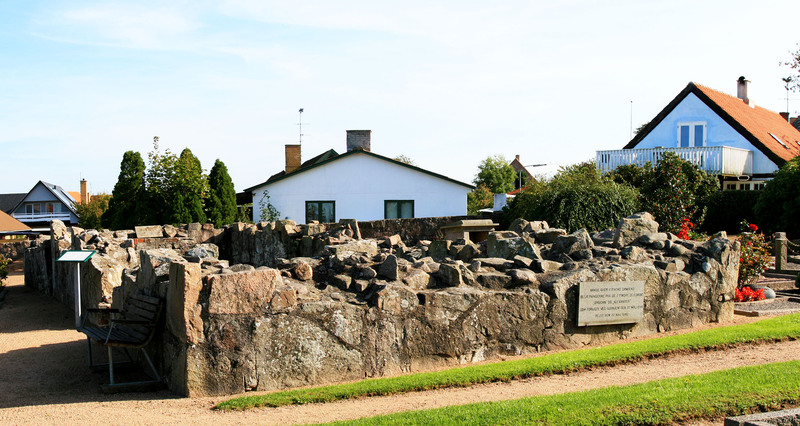 The walls were filled with pebbles and large, broken medieval bricks laid in the “cement mortar” common to Bornholm. Bricks were used around the doors and windows. The roof was hung with Spanish and concave tiles. A porch was added to the north facade after the Reformation of 1536. In 1776, the chapel was rebuilt again. The height increased by a meter and new roofing was added with a brick pitched gable on the west and a half-hipped roof on the est. In addition a new decorative spire was added by the western gable as well as a church bell stock. The stock was replaced in 1870 by a new arbor-shaped one and was located just behind the spire. After the reformation, the chapel was constantly impoverished and in quite bad condition. Its poor condition and need for a larger church resulted in the construction of the present day Gudhjem church in 1893. Town opinion about the fate of the chapel was deeply divided. Supporters of tearing it down wanted to appropriate the ground for burial sites to meet the needs of an expanded church yard. An attempt to preserve the chapel was rejected by the Ministry. Permission was granted to tear it down on condition that the outer walls be preserved as ruins to a height of 1 meter. When those who opposed the chapel’s destruction meant to present their case to the Danish National Museum, those supporting demolition blew up the chapel before national historic preservation could be initiated.